Johnny Pesky has become a Red Sox legend not so much for his eight years playing for the club, but for his lifetime association with the franchise as one of its most beloved figures. Pesky, whose No. 6 was retired in 2008, served as a player, coach, manager, broadcaster, special advisor and goodwill ambassador for the Red Sox, with whom he started in 1942. Pesky was a fixture at spring training, where he liked to work with young players. Here, he chatted with Nomar Garciaparra in 1995. Pesky became a favorite of players and fans alike. He drew mobs of fans seeking his autograph at spring training in 2006. Pesky, right, with Ted Williams, left the Red Sox after his rookie season to spend three seasons in military service. He returned in 1946 and led the team in hits in his first three campaigns. 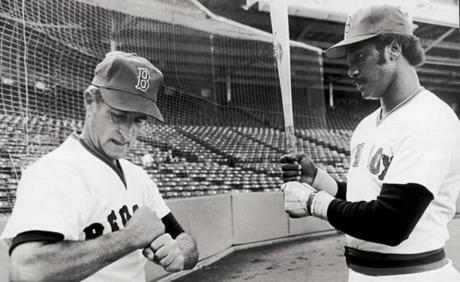 Pesky, left, maintained a lifelong friendship with Williams, and mourned him at the 2002 service the Red Sox held marking the left fielder's death. With Pesky were Dominic DiMaggio, center, and former broadcaster Curt Gowdy. For generations of Red Sox players, Pesky was a source of baseball knowledge. Here, Manny Ramirez gave Pesky a bear hug at spring training in 2002. Pesky regularly dispensed hitting advice, sometimes to players who would go on to become Hall of Famers, such as Jim Rice. In 1995 and 1996, Red Sox manager Kevin Kennedy, left, often called on Pesky for advice. 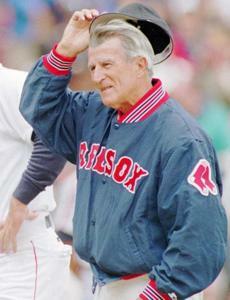 Pesky served as an advisor in the dugout to Red Sox coaches and players, including Roger Clemens, for many years. Working out with Pesky became a rite of passage for Red Sox players, and Jose Offerman took ground balls from Pesky on his first day with the Red Sox in 1999. Pesky, center, helped continue a tradition of longtime Red Sox coaches such as Eddie Popowski, left, and Charlie Wagner (shown in 1997) becoming fixtures at spring training. Curt Schilling spent time conferring with Pesky in 2004, his first spring training after being acquired from Arizona. Pesky has hit thousands of fungoes to Red Sox players at Fenway Park over his decades of service to the franchise. In April 2005, Red Sox owners bestowed a World Series ring on Pesky after the team ended its 86-year title drought. Later that year, Pesky lost his wife of 60 years, Ruth. “She was a hell of a gal,” he said of her. In 2006, as the Red Sox celebrated Pesky's 87th birthday, they officially named the right field foul marker "Pesky's Pole." Pesky, whom the Fenway Park crowd always seemed to love to salute, became a fixture at special occasions like Opening Day in the 2000s. Pesky, with fellow Red Sox legend Dwight Evans, was one of the team's honored guests at Fenway Park's 100th anniversary in April 2012. Pesky played for three teams, including the Tigers and Senators, and was once fired as the Red Sox manager. But he’ll likely forever be linked as one of the faces of the Red Sox franchise.